DIGITAL EDITOR ANDREW STOY: It's almost shocking when a sub-$20,000 car lands in the fleet; really, they're increasingly a rare breed with only entry level C-segment models and the current crop of B-segment rides like this Fiesta left. 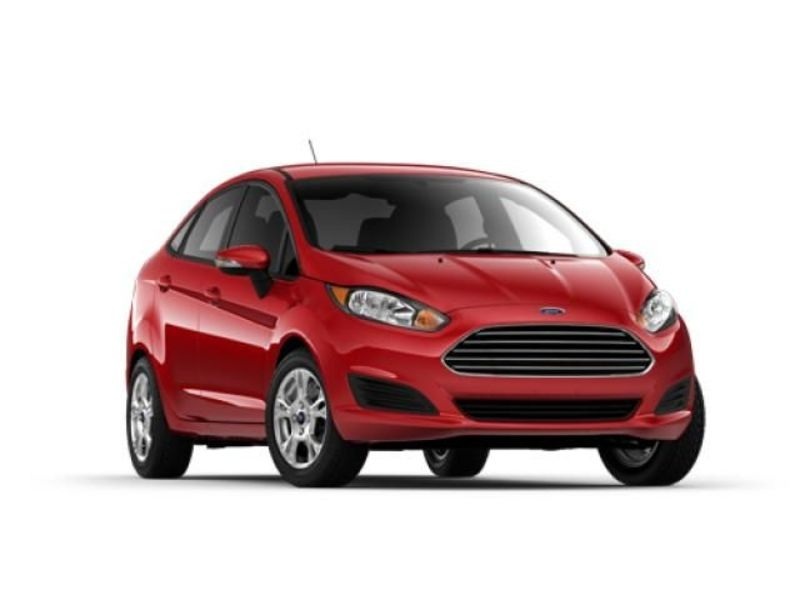 Cheap cars generally aren't “cheap” anymore, and this 2014 Ford Fiesta SE hatchback is a perfect example of the trend. Heated seats, MyFord Touch, ambient lighting, satellite radio and automatic temperature control all yield a car that's far nicer to live with than a certain Spartan German crossover we had a few weeks back with fully double the MSRP. The Fiesta doesn't suffer in driving dynamics, either. While I found myself longing for the Fiesta ST, in 90 percent of situations, the SE has plenty of power, delightfully direct steering and brakes and a really nice stick shift for a front-drive cable setup. The car is unfatiguing in traffic, but at higher speeds a sixth gear would be nice; at 80 mph the Fiesta is hanging around 3,500 rpm and things get a bit raucous in the passenger compartment. So where's the “but…?” Still in the packaging. I like the Fiesta's visual tweaks -- Ford has done a good job giving it a sportier look. But it still has trouble competing with the Honda Fit and Nissan Versa on convenience and interior space. The Fiesta is the driver's car of the bunch, but the Fit remains the true urban warrior thanks to its amazing interior configurability. With that said, if you're downsizing a second car used mainly for commuting or looking for a car for a budding young auto enthusiast, a stick-shift Fiesta is a great option for having fun without getting into too much trouble. SENIOR ROAD TEST EDITOR NATALIE NEFF: The first words out of my mouth when I got home with this Fiesta were, “I could totally live with this car.” Andy is right in calling this the best driver of this sub-$20K segment. It could use more power, but it has a decent shifter that makes it enjoyable to keep the car in the fat part of its power band, and the chassis is solid enough to make flinging this car around a hoot. But it's not the dynamics that compel me so much as the car's overall livability. The Honda Fit has the Fiesta on overall interior flexibility, true. Its seats flip and fold in an origami of configurations. But in all other ways, I hate the Honda's interior, and seeing as that's where you spend most of your time when actually driving a car, it makes for a no-go for me. The Fiesta, on the other hand, is just so easy to live with. For starters, it has the best version of Sync and MyFord Touch I've used yet. Not only is the system highly improved -- thank goodness Ford cleaned it up -- it's precisely because this is such an entry-level car. Knobs! Huzzah! No touch-sensitive haptic-feedback crap here, just basic three-dimensional switchgear to manage all the infotainment and comfort functions. Second, cloth seats! With heat! Any carmaker willing to pair those features wins in my book. What totally sold me was being able to wedge my gigantic rear-facing baby seat in the back, with little consequence to the rest of the seats. The car would serve my little family's needs quite well, and all for a song. EDITOR WES RAYNAL: Spritely little bugger isn't it? Fun to scoot to around town in this car and, yeah, at just less than $19,000 with all this stuff on it, it's a bargain. I mean it's got heated seats, satellite radio, power this and that…all for a fair price. Cool. Driving it reminds me of the proverbial eager puppy bounding around wagging its tail all the time. It's a happy car. I didn't get to drive the ST that was here, but I had a ball blasting around town in the Fiesta. Steering is nice and quick, good ride/handling balance and a decent shifter. It drives like a more-expensive car in terms of chassis solidity and refinement, which is a very high compliment. One thing slightly detracting from the driving experience is some of the buttons on the screen and center stack are tiny, but it's a small car, so I guess one should expect that. Besides, there's a nice big volume knob and knobs for temp and fan speed, so that makes up for it some. This Fiesta SE is a very cool car overall. Would happily commute in one every day. It's definitely in the game with the Mazda 2 and Chevy Sonic. ASSOCIATE EDITOR GRAHAM KOZAK: At $18,925, this 2014 Ford Fiesta SE hatchback costs about 76 percent as much as the $24,785 Fiesta ST we recently enjoyed. Surprisingly, it's about 76 percent as much fun as the hotter mini-hatch. And, yes, I say this knowing full well that it has rear drum brakes. Lack of discs aside, our tester was well equipped for the price -- very well equipped. It might have had cloth seats, but I really appreciated the seat heaters; they're so easy to forget about until the first cold snap. MyFord Touch was there. If you don't like it, I don't really know what to say, except get used to it (it's a painless process, really) or don't buy a Ford. Unlike the ST, the SE's 1.6-liter four wasn't turbocharged, hence its 120 hp compared to the performance-oriented hatch's 197 hp. But even if the cheaper car never really felt fast, it still felt quick -- so long as you're ready to work the gears. Torque steer is even less of an issue than it was in the pleasant ST. I didn't manage any highway time, and I have no doubt that the car would be up to the task, but I think you'd really be wanting for a sixth gear if you plan on doing a lot of expressway cruising. At 45 mph, the engine wasn't exactly complaining, but it was certainly making its presence known. Add a few thousand rpm to that, and I'll bet it gets whiny. Around town, though, you're just fine. As Andy notes, about the only place this really loses out is cargo capacity; with 14.9 cubic feet of cargo space in the back, the Fiesta loses out (relatively) big-time to, for example, the 18.8 cubic feet of space in the Nissan Versa Note. It might seem like a mundane reason to pass on a car, especially in light of how much fun we've all had driving it, but for a single-vehicle household, it could be a deal breaker. That said, I'd take the hit and go with the Ford, though -- the interior is a nicer place to spend time, and it's much more fun on the road. Options: Equipment group 201A including SE appearance package, Sync with MyFord Touch, satellite radio, 16-inch painted aluminum wheels ($995); navigation ($795); comfort package including heated front-row seats, dual-power heated side mirror, electronic automatic temp control ($290).